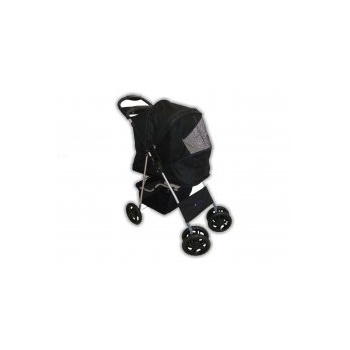 Internal Compartment Dimensions: L22" by W13" by H23"
Collapsed / Folded measurements L30" by W16" by H13"
This is a wonderful, fold-flat 4 Large Wheel Jet Black Pet Stroller with a heavy-duty yet lightweight steel frame. 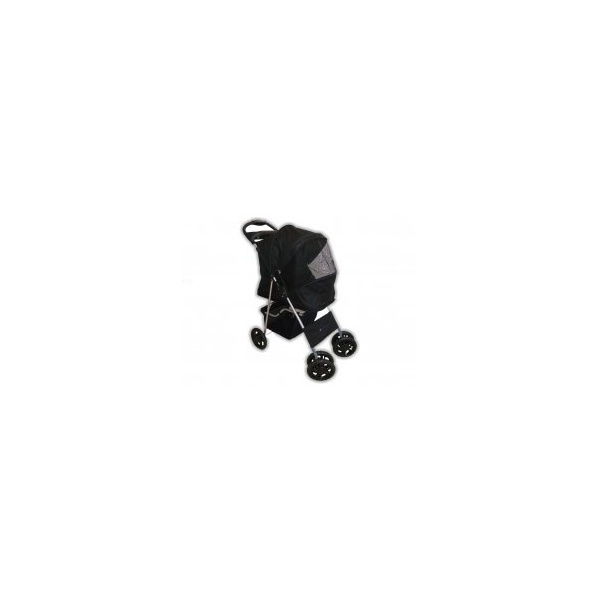 The stroller is manufactured with high quality water resistant 600 Denier Polyester Fabric and is of the latest design straight from the United States of America. The superior four-wheel mobility keeps the ride safe and smooth without stressing your dog out whatsoever. Furthermore, the four wheels will not bog down in muddy grounds and therefore makes this pet stroller ideal for any UK weather - the wheels are extra large in size rather than the standard size of 5" sold by other retailers. .A Dog Pet Stroller is definitely the most stylish and practical way of getting your pet and your dog accessories out and about on the dog show circuit as well as for long enjoyable walks. Save your dogs joints and stop it from overheating in the summer. If your dog is in the pet stroller while it is sunny, it will stay cool in the shade of the pet stroller and the mesh windows will allow fresh air circulation for maximum breathability keeping your dog cool and happy whilst still being able to admire the view. Pet Strollers are also perfect for older dogs who enjoy the fresh air, but not the walking part of a walk anymore. You can still take your "oldies" out and let them enjoy the outdoors even if they have hip problems, arthritis or visual impairment. The pet strollers are of lightweight design and only weigh 6.5kg, which means they are easily lifted in and out of car boots. Of course these pet strollers come complete with a dog lead safety clip, allowing you to secure your dog in your deluxe pet stroller. Also ideal to socialise a small litter of puppies and introduce them to the outside world from the safety of the den-like pet stroller. However also useful for two small breed dogs, who have always been inseparable. An absolutely superior product and the first in the UK with the easy down function & extra large wheels. RRP is £149.99, so grab yourself a real bargain today.